21 yo M with no PMH who presents with a sudden onset of acute epigastric pain radiating to mid back, sharp and stabbing in quality and associated with nausea. Per patient he had no symptoms prior to the episode, he was doing chest compressions on a patient when he had the sudden onset of symptoms which lasted for 45 minutes and were partially relieved by tums. He has had similar symptoms in the past about 1 year ago which resolved spontaneously. Pt denies any fevers, chills, vomiting, diarrhea, chest pain or shortness of breath. GI/ABDOMEN: s/nd/+mild TTP to epigastric region, negative murphy's signs, no peritoneal signs, No organomegaly, or pulsatile mass. MUSCULOSKELETAL/EXTREMITIES: No pedal edema on exam. INTEGUMENTARY: Color normal for race, warm and dry, no rash. 1. What is abnormal about this picture? 2. What are the 3 vessels in the portal triad? What is the sign noted below? 3. How can you differentiate between the CBD and Hepatic artery? 4. 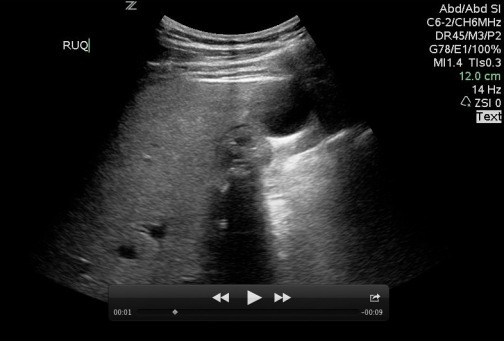 What findings in this patients' ultrasound suggest cholecystitis?